It’s safe to say that Oilers fans were very, very ready for playoff hockey on Wednesday night, even if their team wasn’t. After an 11-year drought, the Stanley Cup Playoffs returned to Edmonton as the Oilers opened up their first-round series against the Sharks with a home game at Rogers Place. The Sharks ultimately took the opener in OT after the Oilers let an early lead slip away, but it certainly wasn’t for lack of home ice advantage. 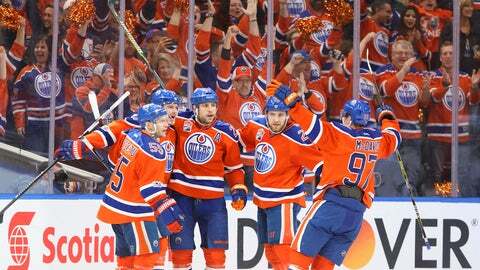 They had more than a decade to prepare, but Oilers faithful came out in full force. You could tell from the excellent anthem that it was going to be a special night. The team has really been pushing the theme of “Orange Crush” heading into the postseason. They made the decision to ditch their blue primary home jerseys — one of the best in hockey, in my opinion — in favor of their orange alternates (which will become primaries next year) for the entirety of their postseason run. That choice was booed by many — including myself — but judging from the crowd in attendance on Wednesday, the fanbase is embracing it. Honestly, the sea of orange was a sight to behold. I’m coming around on it. People in Edmonton love hockey. The Oilers gave away alternate sweaters to season-ticket holders at the beginning of the year. It was a very loud sea of orange, too…at least in the early stages of the game. Here’s the frenzy that ensued after the Oilers jumped out to an early 1-0 lead with their first postseason goal in almost a dozen years. Of course, a crowd’s atmosphere is typically only as strong as the team’s play on the ice. The excitement at Rogers Place eventually turned into quiet nerves as the game went on and the Sharks climbed back into Game 1. Those quiet nerves eventually turned into disappointment and double-birds following the OT-winner from San Jose’s Melker Karlsson. But if Game 1 was any indication, Edmonton will have one of the loudest and most fun arena atmospheres in this year’s playoffs as long as the team doesn’t stink. Speaking of stink, Rogers Place is going to need to figure out its bathroom situation before the Orange Crush is totally incapacitated.